Compressed information: On this page we are giving an overview of the goals, the plant’s functional principle and facts and numbers about this small plant (as far as we know them). This product datasheet is also available as PDF at the Documents section. This is a product datasheet, which summarizes the properties and boundary conditions of the solar thermal water disinfection plant, as it is constructed following the associated construction manual. The following sections serve to increase comprehension and to work as a planning guide. Due to numerous unpredictable inﬂuences the given information should rather be seen as a rough benchmark than exact performance numbers. Based on the limitations described in the following chapters this plant does not ensure that the water is drinkable after being processed by the plant. The author of this text does not guarantee the correct functioning of the plant. He is not liable for damage or harm on objects or persons resulting from a plant built in conformity with the construction manual or from the activities described in that manual. He is also not liable for damage or harm on objects or persons resulting from a plant operated as described in the user manual. Based on rainwater stored in tanks the small plant is to reduce the microbiological contamination of water through solar thermal heating. The developed plant is supposed to enable independent buildup with local material and basic tools. The thermal treatment of the water is driven solely through solar radiation. A ﬂat plate collector is responsible for the heating process. This technology is already well-established on a global scale. To control the water output we developed a new concept, whose process is illustrated in ﬁg. 3. The shown hydrodynamic system can be divided into two sections. 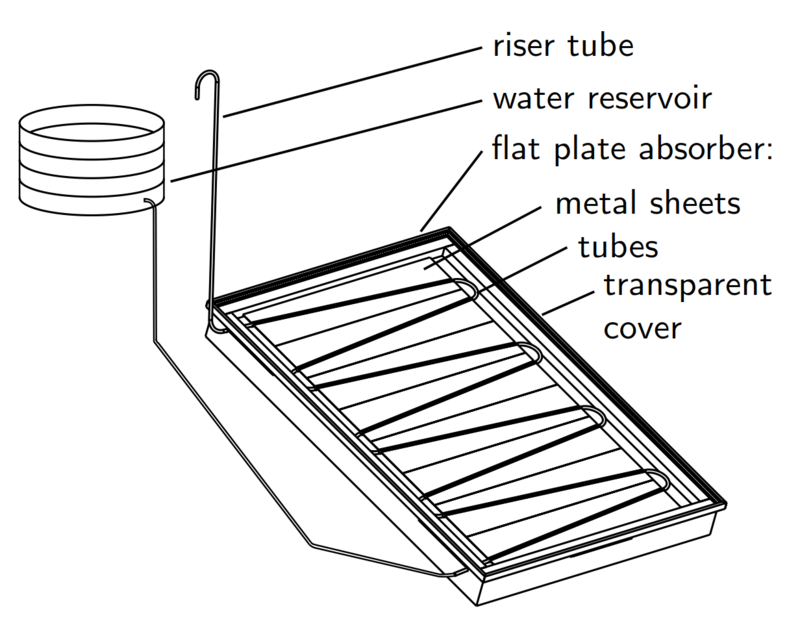 On one side the cold section with a reservoir ﬁlled with the water which is to be treated (ﬁg. 3, right side respectively). On the other side the heated section being connected to the cold section. Here the water is heated up. The initial state is shown in ﬁg. 3a. With a homogeneous temperature the water reaches on both sections (almost) the same level according to the principle of communicating vessels. After a heating process (ﬁg. 3b) a fraction of the water in the heated section evaporates (ﬁg. 3c). Due to suﬃciently small pipe diameters in this section the water vapor cannot pass the the water above and thus cannot escape the system prematurely. A density difference between the cold and the heated section (including the vapor) arises and therefore gravity then forces hot water together with vapor out of the system (ﬁg. 3c, depicted through the black arrow in the upper left corner). In the following step cold water ﬂows from the reservoir to the heated section and the cycle begins anew (ﬁg. 3a). Dietl, Jochen ; Engelbart, Hendryk ; Sielaff, Axel (2015). 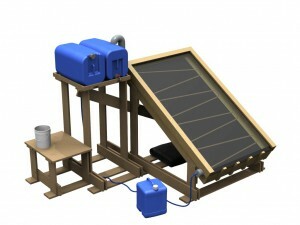 A Novel Type of Thermal Solar Water Disinfection Unit. http://tuprints.ulb.tu-darmstadt.de/4460/. At temperatures below freezing point the plant has to be emptied completely. If the plant is not used it has to be covered to prevent very high Temperatures. The plant’s angle of inclination against the ground is depending on the location 20° … 30° (e.g. Germany). An even ground is needed in case the pedestal suggested in the construction manual is used. The plant needs to be installed at a site where it is not covered by any shadows, preferably throughout the whole day. If pests exist locally, the plant has to be protected from an infestation of wood and insulation material (e.g. through treatment of the material, usage of a metal pedestal, or mounting to other objects on the site). The parts procurement will be done locally. If necessary all water touching parts have to be cleaned before initial operation. In addition, tools are needed to bend sheet metal and pipes. Many workshops are suffciently equipped to at least allow for bending sheet metal. In case appropriate tools are not available to serve these two purposes there are appendices to the construction manual to build respective the tools listed above. Further tools can be necessary if material cannot be obtained in the required condition (size, shape). At least two people are needed for the construction. If more than three are working together some sections of the manual can be worked on in parallel. This can reduce the construction time. An experienced team can build the plant within two days if all the material is present at the site. The cost of the material heavily depends on local prices. Additionally, the costs can be reduced drastically through reuse or alternative ways of acquisition. Therefore the total material cost can be assumed to be below 150 € . The technical details depend on the chosen plant dimensions. 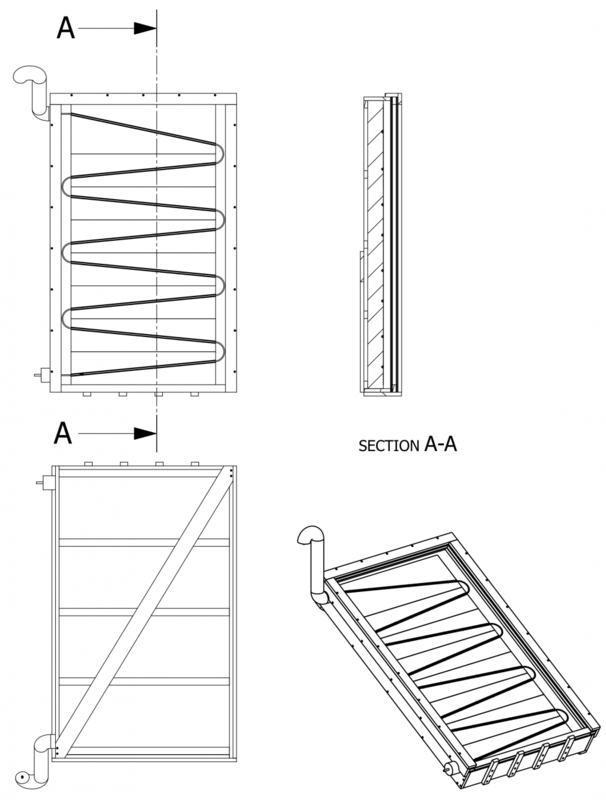 The following data refers to the dimensions in the construction manual. The plant weights about 95 kg (empty without adjacent systems). The glass panes alone account for 40 to 45 kg off the 95 kg. 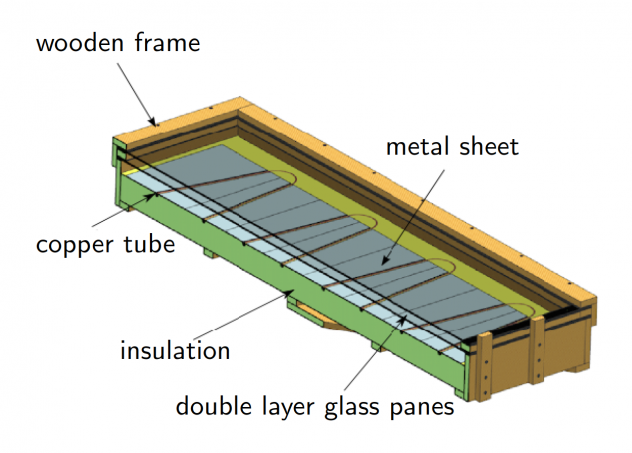 Glass panes made of PMMA (Plexiglas) with the same dimensions would weight about half. The quantity of treated water heavily depends on the environmental conditions. The water quantity output of a prototype in the area of Darmstadt, Germany is shown in ﬁg. 4 (upper part in blue). Keep in mind that this diagram is meant for orientation purposes only. The better documented august was very unsettled that year which can be seen in the recorded hours of sunlight (lower part in orange) by the DWD (German Meteorological Service). The maximum throughput reached ca. 23 L/d. This amount is expected to be outperformed in equatorial regions so that an output of 40 to 50 L per day is estimated. Even though the plant uses diffuse solar radiation we do not expect any output in weather conditions like rainy seasons. Since boiling water is a punctual treatment method the water can be recontaminated relatively soon after the treatment (depending on storage conditions). Therefore it is advised to consume the discharged water within one day. Thiemann, Fabian (2015). Untersuchung der Funktionsfähigkeit einer kleinskaligen und solarthermischen Trinkwasseraufbereitungsanlage. Technische Universität Darmstadt. The maximum measured load of E. coli bacteria in our experiments was 6.6*10^6 /100 ml (MPN) and of total coliforms 2.4*10^7 /100 ml (MPN). Fig. 5 shows the contamination characteristics of the input water. In our experiments we used water with a very high pathogen concentration to identify performance limits of the plant. The pathogenic load of input water is normally lower. Figure 5: Concentration of E. coli and total coliforms in the input water. (On days with both values equal to zero the measurement of the concentration is not available.) The concentration of the output was always reduced below the detection limit. The water must not have any chemical contamination. The plant cannot treat chemical pollution. The turbidity is not purposefully inﬂuenced, therefore the untreated water should already have a turbidity-level in accordance to the WHO-recommendation which is shown above. The literature regards a turbidity up to 200 NTU as acceptable for thermal treatment of water. A lower turbidity means generally a lower microbiological concentration. There are no particular requirements on water hardness. The harder the water input the more limescale precipitates in heated sections of the plant. The WHO demands a pH in the range of 6.5 and 8.5 for drinkable water. When deciding on the water source it should be considered that on one hand the pH is raised through the plant in a small degree (see ﬁg. 6), on the other hand an acidic environment increases the precipitation of limescale in the water (see chap. 7). The concentration characteristics of E. coli and total coliforms in the input water shown in ﬁg. 5 were reduced below the limit of detection (1 /100 ml (MPN)) in every taken composite sample. This indicates a reduction performance of E. coli bacteria of at least lg 6.8 and total coliforms of at least lg 7.4. For further information see the bachelor’s thesis mentioned above. pH rose during the experiments by an average of 0.84. This increase is attributed to the reduction of the CO2 concentration in the water. Fig. 6 shows the pH characteristics of both the plant’s in- and output. Figure 6: pH results of composite samples from in- and output. The temperature of water and material at the water output (riser tube) reaches 100° C. Risk of scalding persists in these areas. Additional insulation, protective barriers or warning notices can help reduce the risk. The output canister should be located as close to the riser tube output as possible. At best both are ﬁrmly connected to each other. The large-scaled glass panes can break. It should be payed attention so that no heavy objects drop on the glass panes or are placed on them. Preferably mount the plant at a safe/protected area. If infants or small children are among the users the water should be examined concerning potentially increased concentration of copper. In case of doubt, alternative means of supply should be sought for these persons. The title page shows a rendering of the plant including the necessary adjacent systems. Various technical drawings of the plant without the adjacent systems are presented in ﬁg. 7.